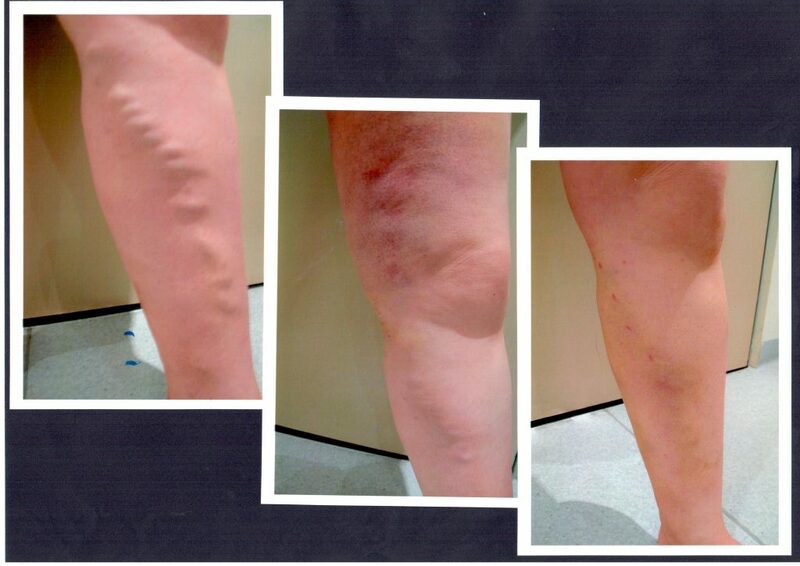 EVLT is usually performed under local anaesthesia and uses a laser fibre to close the varicose vein from the inside without the use of a scalpel. A laser fibre is passed through a small cut in the skin around the ankle or knee into the varicose vein. Once guided into place by ultrasound, local anaesthetic is placed around the vein so the procedure is not painful. The laser is then fired, delivering laser energy to the wall of the vein. This causes inflammation of the vein walls, which over a period of weeks/months fibrosis occurs and the vein closes off. EVLT has a high success rate, with over 95% patients experiencing an improvement in their symptoms. The recurrence rate of varicose veins is 5-20% after 5 years (compared with 20-80% with surgery). It is not unusual to have a top up (sclerotherapy) procedure in the months/years after treatment. Bruising – this can be quite colourful (black and blue) for up to 2 weeks along the inner thigh. Numbness over the treated area – usually temporary, can sometimes last for a few weeks or months. Inflammation of the veins, which is intentional – may cause localised swelling, tender lumpy areas and tightness along the inner thigh. The associated pain is often described as a “pulled muscle”. If you have any further questions regarding Endovenous Laser Ablation (EVLA), please do not hesitate to contact our Claremont rooms on (08) 9284 2900.